Updated to correct pipeline maintenance schedule. Regional natural gas infrastructure issues in Southern California could affect electricity reliability this summer, according to separate studies recently released by the Southern California Gas Company (SoCalGas) and the Aliso Canyon Technical Assessment Group. Depending on natural gas infrastructure changes and storage operations this summer, these issues could also have implications for the upcoming winter. 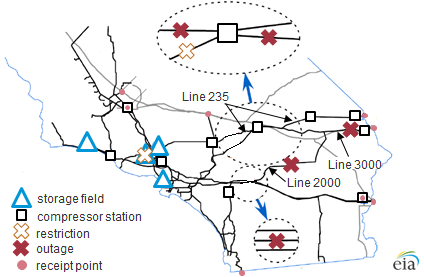 The Aliso Canyon Technical Assessment Group, which includes the California Public Utility Commission, the California Energy Commission, the California Independent System Operator, and the Los Angeles Department of Water and Power, concluded that base case total system deliverability capacity—a combination of the natural gas pipeline system and the deliverability capacity of non-Aliso storage working gas—is slightly lower than 3.6 billion cubic feet per day (Bcf/d) this summer, or 0.2 Bcf/d lower than last summer when pipeline outages curtailed deliverability. If daily natural gas demand exceeds 3.6 Bcf/d—which is relatively common in winter months but has occurred only once in the past five summers—some natural gas deliveries to electric generators may need to be curtailed. Since October 2017, SoCalGas has experienced a series of planned and unplanned natural gas pipeline outages that have reduced the ability to bring natural gas into Southern California. According to the May 7, 2018 SoCalGas maintenance schedule, pipeline repairs are not expected to be completed until the end of summer, with key pipelines—Lines 4000, 235-2, and 2000—showing no scheduled completion date. Pipeline capacity for summer 2018 is about 0.53 Bcf/d lower than at this time last summer, but storage deliverability is about 0.4 Bcf/d higher. Natural gas inventories in Southern California are typically refilled over the summer months. However, electricity demand is higher in the summer months, and natural gas is a key fuel source for electric power generation in Southern California. 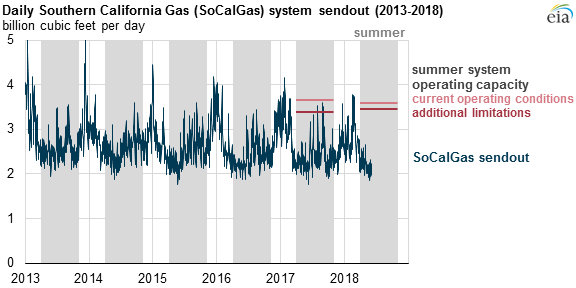 According to SoCalGas, the current outages will create challenges this summer for meeting customer demand while also refilling storage inventories. 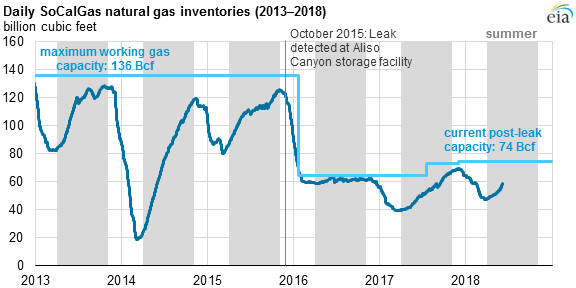 The timing and extent of refilling natural gas at SoCalGas’ storage fields have changed since a leak at the Aliso Canyon storage complex was discovered in October 2015. Aliso Canyon, previously the second-largest natural gas storage facility in the United States, had its capacity reduced from 86 billion cubic feet (Bcf) to about 25 Bcf as a result of the leak. The total capacity of the four storage facilities in the SoCalGas service territory declined from 136 Bcf to 74 Bcf. Working gas inventories as of June 6, 2018, totaled 58.2 Bcf, which is low by historical standards, but 11 Bcf higher than at this time in 2017 and 4.1 Bcf lower than at this time in 2016. EIA provides a daily summary of key energy conditions in Southern California on the Southern California Daily Energy Report. In addition to the daily summary, EIA provides occasional commentary and analysis on notable market conditions in Southern California.